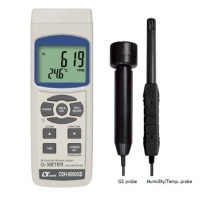 Categories: Hand-held Tester, Lutron, Vibration Meter, Vibration Meter. 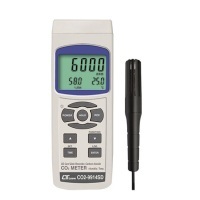 • Vibration Meter Mode : 4 Channels vibration measurement input : One display screen shows all 4 channels of Acceleration, Velocity,Displacement values at the same time. 1. Real-time analysis frequency 10 kHz. 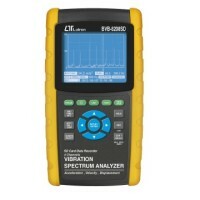 2.Time waveform display and spectrum display with up to 1024 spectral lines. 3. Vibration waveform data recording function. Data are store in WAVE file format on SD memory card. • Built-in clock and Calendar,save real time data information into SO memory card. Sampling time can be set from 1 to 3600 sec. • Data file can be downloaded to the Excel, extra software is no need. • Waveform can be saved into BMP file, easy operation and it is useful for the further analysis. • Time information : Year, Month, Date, Hour, Minute and Second. Displacement ( p-p ) :2 mm. • Max Hold, Peak Value,Data Hold, Max/Min..
• SO memory card capacity :1 GB to 16GB.